Ken Kremer, Kennedy Space Center, Florida: Not all the exciting space exploration action at the Kennedy Space Center this week is related to the impending November 1 launch of Discovery on her final mission - STS 133. 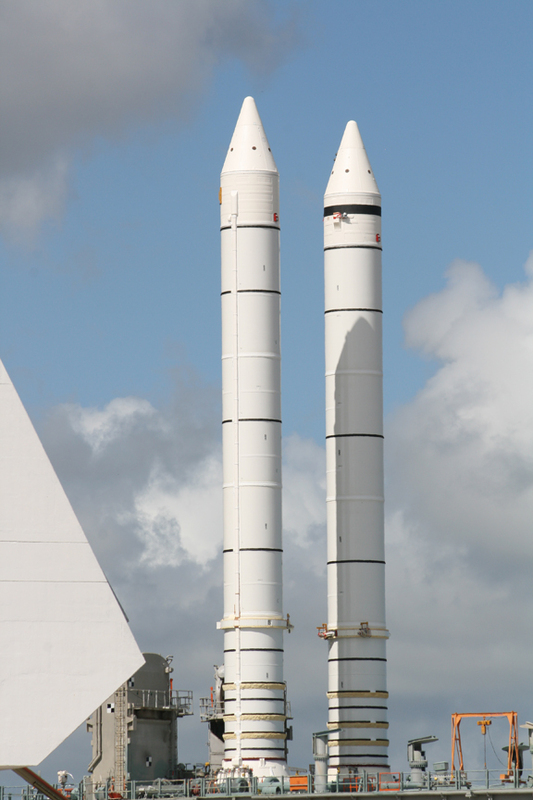 The twin Solid Rocket Boosters (SRB's) that will power Shuttle Endeavour for her final flight to orbit in February took a rare road trip outside the iconic Vehicle Assembly Building (VAB) at the Kennedy Space Center today, Wednesday, October 27. 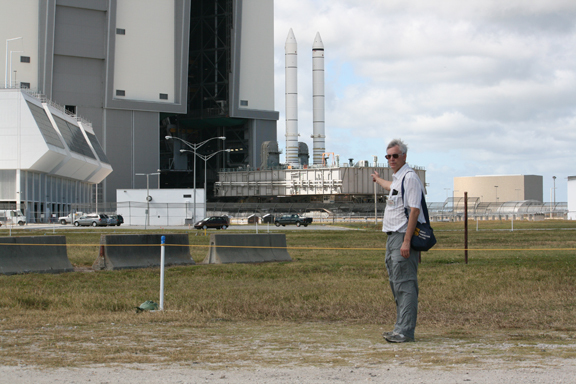 I witnessed the beautiful move first hand from just a few hundred feet away at the outskirts of the VAB. 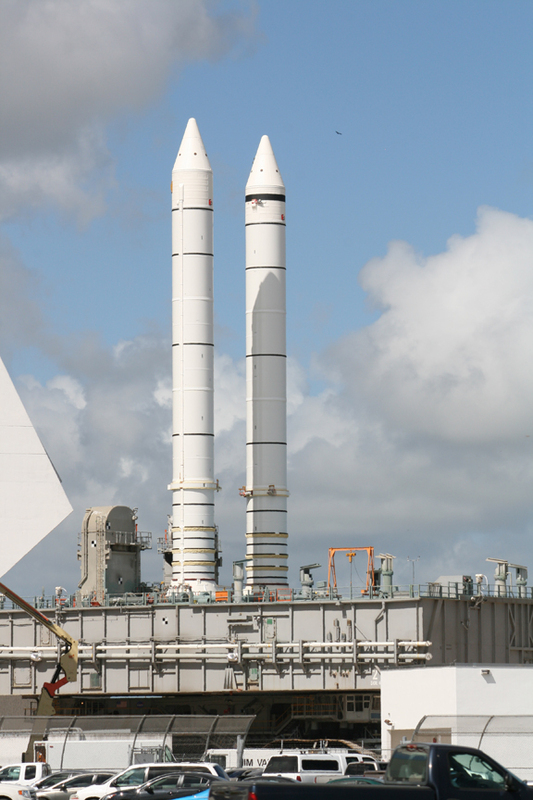 The scene was made even more remarkable since it was conducted adjacent to the Ares 1 Mobile Launcher built for NASA's now cancelled Project Constellation Return to the Moon program. See my photos below. 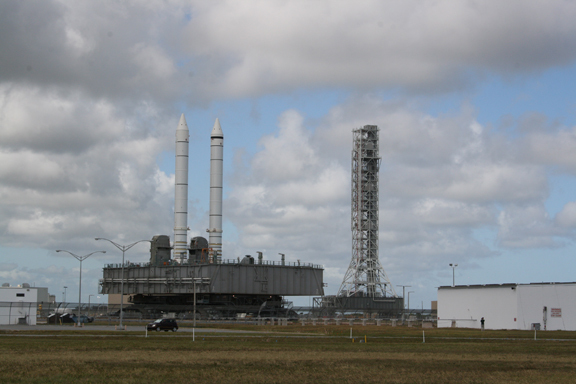 The SRB pair was vertically stacked in launch configuration atop the mobile launch platform (MLP) and moved the short distance from one VAB high bay to another. 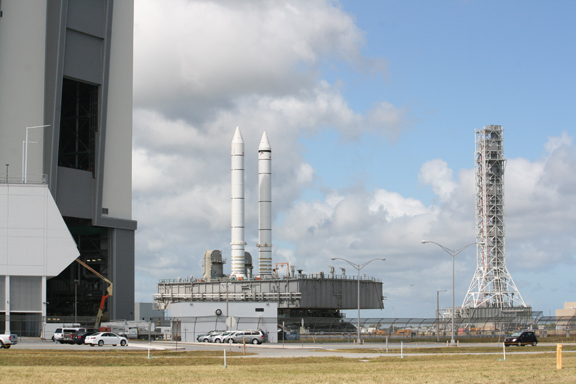 The massive diesel powered crawler-transporter was slowly driven outside High Bay 1 at about 11:30 a.m EDT and then rolled back into the adjacent High Bay 3 around 2 p.m. At one point the 15 story tall shiny white shuttle SRB's were a stone's throw away from the Ares 1 launch tower. Intermittent sun and clouds caused one booster rocket to cast a striking pointy shadow on the other one. The visually stunning move of the skyward facing rockets - which resembled a pair of thick toothpicks - took a few hours along the path of the shuttle crawlerway that ultimately leads to the launch pads at Complex 39. A NASA spokesman told me that the SRB's will be mated to the External Tank around mid November. 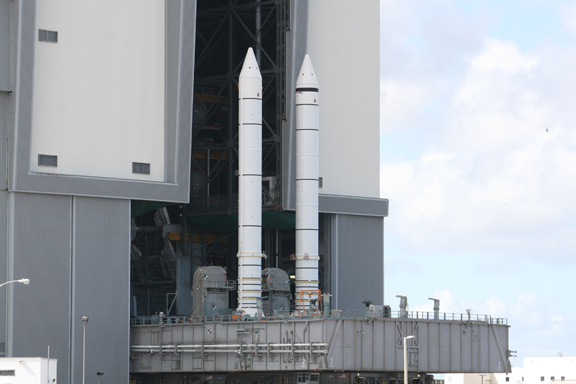 The waiting fuel tank - ET 122 - is already stacked vertically inside the VAB. ET-122 was damaged by Hurricane Katrina while it was under construction. It was recently restored to flight status at NASA's Michoud Assembly Facility in New Orleans and transported by an ocean going barge to KSC. The Endeavour launch is slated for Feb 27, 2011 on the STS 134 mission which will deliver the $1.5 Billion Alpha Magnetic Spectrometer (AMS) astrophysics payload to the ISS as a last hurrah for science from the shuttle program. The AMS will study the origin of the universe and search for the elusive dark matter. STS 134 is currently the last flight on the shuttle manifest. 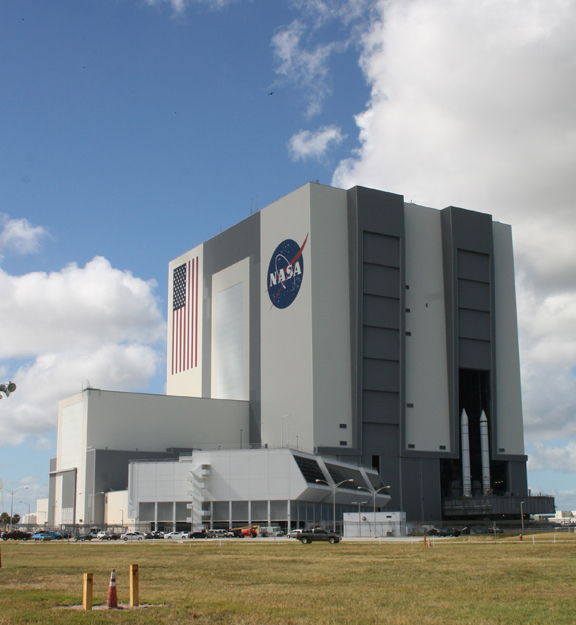 Congress recently authorized one more shuttle flight - STS 135 - but must still formally approve the funding before NASA can commit to fly the mission with shuttle Atlantis.